3000 billion tons of coal off Norway's coastline The Oil Drum Thomas Friedman: "Green is the New Red, White, and Blue"
The lecture itself can be found over at GPM now (because FTD is no more, sadly): (link). I asked my son and his fiance to sit down and watch Dr. Bartlett's lecture a while back and when it was done, they both stated that no one had ever put it so clearly before. My son is a "math phobe" but understood it readily and easily. His fiance is a biochem major and not a math phobe and she did as well. But what was startling was their comments about never having seen anyone put it so simply before. I recommend the video of the lecture as a wonderful tool to introduce anyone to the absurdity of the cornucopian positions. I agree! I could not get my Dad (PhD in EE, BS in Physics, Professor, etc.) to pay attention to my PO concerns - until I sent him Dr. Barlett's presentation. Then he said "OK, you win". There are still the questions about the timing, the extent of the effects we may see, etc. - but he quit hiding his head in the sand! I first watched Dr. Bartlett's presentation a few months back. It really helped things come into clearer focus for me. All of a sudden I could see the bigger picture and how everything is tied together. I plan on sharing it with anyone I can get interested when the subject comes up. One of biggest contributions that I can make to the PO cause is to help raise awareness. Once enough people 'get it' (I would hope) that we can start to see more positive change. It used to be that we had front porches in our neighborhoods and (before TV. and AC) we would go outside after dinner to talk with our neighbors about important world and local events. Is it just me or does the GPM link to Bartletts speech have no sound? hmmm...that link worked for me. :( though the link below has some really cool extras in it. FatherOf4 used to have a site called Flying Talking Donkey, which was a news aggregator and an interesting site. He took it down a couple of months ago. Without any serious news about it, Oil is back at 64 dollar a barrel. It is nice to see how easy people get used to things that where considered shocking earlier. Last year everybody was talking when oil hit 64 dollar! And natural gas is down to 9, suggesting that a lot of customers switched fuels?? Two things I thought should have been noted in Bartlett's review of Simmons' book: first, that Bartlett is an emeritus (i.e. retired) professor. They just gave his affiliation as U of Colorado. And second, he is a long-time Peak Oiler, at least back to the 1970s, as noted at http://www.hubbertpeak.com/bartlett/ . He already has a strong and longstanding position in this debate but his review didn't make that clear. As far as exponential growth, while Bartlett's lecture makes it sound unsustainable, the truth is that the human race has been undergoing exponential growth for the better part of a million years. In fact our growth (in both economic power and population) has been faster than exponential. See economist/physicist/AI researcher Robin Hanson's paper at http://hanson.gmu.edu/longgrow.html . In particular his figure 1 at http://hanson.gmu.edu/grow/fig1.html shows just how long this pattern has been going on. At any time in the past people might have looked around and said, how long can this go on? Most famously, Malthus did exactly that 200 years ago. Yet every time, we have burst through the barriers and come up with ever more effective ways to exert our control over the natural world. It's possible that this time is the exception, that this time at last the million year old trend will be reversed for the first time ever; but such a long record provides its own weight of evidence for the continuation of the pattern. Hanson's paper is making the point that economic growth (measured as gross world product) has been increasing faster than exponentially for a long time, or more precisely that it can be modelled as an overlapping series of exponentials with rates that have increased with each characteristic epoch. It doesn't say the same is true of population growth, at least recently, and certainly we're lucky that population growth is easing away from its previously exponential (in the recent past) and super-exponential (going further back) track. But I really take issue with is the idea that because super-exponential growth has gone on for a long time, it's a priori plausible for it to continue for quite a while. In fact, the more super-exponential the growth function, the less reasonable it is to extrapolate that way from the past! In the extreme case, you could have a pattern of very little growth at all until the last 10 years, where you have hyperbolic growth taking off towards infinity in another 10 years. Few people would suggest extrapolating on that basis. As a side note, I'd bring up Jared Diamond's Collapse and point out that in many regional instances neither economies nor populations managed to maintain (super-)exponential growth. Since until very recent centuries human history is a sum of generally isolated regional human histories, we would do very poorly to ignore these natural experiments now that we have in effect only one big population. Now, I'm not arguing that economic growth as measured by world domestic product can't continue steady exponential growth, or perhaps even super-exponential growth, though I have severe doubts about the kind of Singularity Hanson appears to entertain purely from the models. Dropping energy per GDP is by itself of little use; there's no sign that rich countries are yet spending enough of their wealth on intangibles and services to stop increasing their total (or even per capita) ecological footprint. We've been granted a demographic gift of a population that may stabilize on its own below 10 billion in this century, but that bit of luck will be of little use if we rely on luck (or price signals alone) to prevent the pain and dislocation of resource scarcity. Dropping energy per GDP is by itself of little use; there's no sign that rich countries are yet spending enough of their wealth on intangibles and services to stop increasing their total (or even per capita) ecological footprint. The general increase in GDP/energy. Increasing amounts of energy from wind, solar and biomass. Technologies under development which use gasification to convert coal, biomass or waste to liquid fuels; these could be used to make petrochemicals as well or instead. If you push these trends a little harder, we might see economic output continue to go up and energy use continue to increase for a while, but fossil energy might start to shrink as it's replaced by renewables. The same technology which lets Rentech make ammonia and F-T diesel from coal would let DuPont convert corn stover, sugar beet pulp and waste plastic of all types to fresh new monomers. New and remodeled buildings could be insulated and draft-proofed with urethane or styrene foam, slashing energy requirements. Relying on price signals is probably a bad idea, as you suggest - unless those signals include mortgage credit limits. If people are not allowed to borrow as much to purchase homes with high energy expenses (and thus payment risks given volatile prices), at least one of these problems will be addressed in a timelier fashion. About four fifths of the way down the page they discuss a population bottle neck 70-80,000 years ago, based on miochondrial DNA evidence. It seems the human population may have numbered as few as 10,000 at that point. The time frame coincides with an erruption of the Sumatran supervolcano Toba 74,000 years ago, which would have had dramatic effects on the climate. That erruption was near the high end of the volcanic explosivity index, putting it at perhaps 10,000 times (or more) as intense as the erruption of Mount St Helens (if memory serves). For what it's worth, there's another supervolcano with similar explosive potential under Yellowstone Park. It seems to errupt about every 600,000 years, and the last erruption was 640,000 years ago. There are some things that make even peak oil look insignificant. I'm glad you brought up that population bottleneck issue, Stoneleigh--I was going to but you already had. The genetic evidence points to a human population (perhaps after Toba) of as little as 10,000 individuals. But, it's been up & up ever since, hey? I wouldn't say it's been "up and up" ever since. It was basically flat - up and down - for a long time. 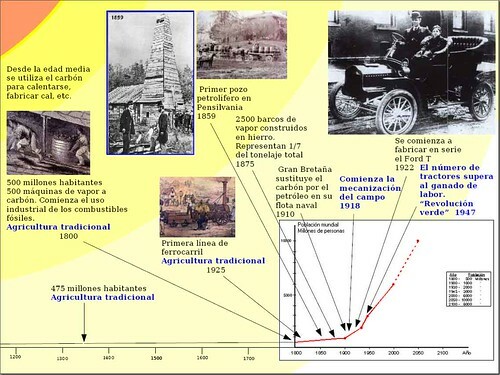 With agriculture it started going up slowly, but didn't really start looking exponential until we started exploiting fossil fuels. Nice graph. Year 1400 AD--The The Black Death: Bubonic Plague. Years 600 to 1000 AD--The Dark Ages. But I'm glad you posted that. Why? Because it gives us OilDrummers a sense of history and the effects of geopolitical or natural shocks to the system. It's all well and good for Stuart and others to do their modelling (I'm a big supporter of that)--but reality inevitably involves these kinds of events. So, really, thanks for you post. I think it's clear that human ingenuity alone is not enough to overcome resource limits. Cheap energy from petroleum and the technology we've made from it has sheltered us from the dieoffs we used to suffer regularly in the past. The Black Death may not be entirely unrelated to population. Bubonic plague existed for millennia in Europe and Asia; why did it suddenly become a pandemic? Some researchers believe that it was because rapid population growth left people vulnerable. Many were suffering malnutrition, weakening their immune systems. Others even argue that the Black Death was several different diseases, all spreading because the population was vulnerable due to insufficient food. This article explicitly links the Black Death with the Great Famine that preceded it. It also argues that the shortage of firewood caused by the growing population created hygiene problems; heating water for baths in winter became a luxury only the wealthy could afford. I suspect that many of the seemingly random "events" we see as separate from energy issues are not. War and disease are much more likely when there's too many people and not enough resources. Yes, I tend to see a lot of connections to the problems we face now. And I think the root cause always goes back to population. You might enjoy A Distant Mirror: The Calamitous Fourteenth Century by Barbara Tuchman. The Great Wave: Price Revolutions and the Rhythm of History by David Fischer also covers that period and is quite illuminating. I agree that a sense of history is very important to set events in context. There's some suggestive evidence that the Dark Ages may be been precipitated, at least in part, by an ealier, and larger, erruption of Krakatoa than the one documented in 1883. It seems that subduction zone hot spot errupted in about 535 AD and may have lowered global temperatures enough to stress the existing social structures, although nothing like as much as the Toba erruption would have. For further information see the book Krakatoa by geologist Simon Winchester. They write on volcano and comet disasters, from the point of view of sulfate levels in ice and ring width in trees. The point being that bad weather breaks civilisations. Human evolution happens to be one of my interests, Halfin, and talking about million year trends strikes me as a bit fantastic. One million years ago Homo erectus was running around just like any other animal making a living as best they could in their ecological niche. They certainly were not involved in any activities like those our species have engaged in from the beginning of the Holocene up to the present time. Actually, there is good evidence that these same Homo erectus guys had thick, elongated skulls and large brow ridges because they (at least, the males) used to bash each other over the head to settle disputes (probably mostly over mating partners and territory). I won't dispute that a million years ago, these hominids were among the most dangerous predators then existing. Now, of course, Homo sapiens, having helped pushed Homo neanderthalensis into extinction, reigns supreme. And there is no doubt about what animal is the most dangerous predator on the Earth anymore. Taking the very long view in Geological Time, it would appear that Nature made a big mistake in the Pleistocene. Still, I'm sure that most of us are glad to be here even if the timespan for our continued existence is somewhat problematic--again taking the very long view. So, maybe things haven't changed much.... Now we just prey on each other and the rest of the natural world. I could provide hundreds of references if you like but don't ask. In any case, this tends to cast doubt on the source Robin Hansen you cite in your comment. Dr. Bartlett was the person who pushed me into the true belivers catagory. I was listening to his lecture on GPM in the background while reviewing oil blogs. I had to stop and watch his talk twice. You hope he might be wrong, but you know that he probabally is right on the money. I wish our government had to hear him. Homo Sapien has a finite brain. Most of the brain mass is consumed by emotional "thinking" (day-by-day survival, procreation, power, control, social status, etc.). A thin layer, known as the neo cortex, is believed to be engaged in "rational" thinking. Evidence is abundant (even though we each wish to deny it) that the neo-cortex can absorb only a limited amount of information for defining its own internal "frame" or model of the outer world (of surrounding reality). 1.If you grow up as an "economist", then you probably tend to "frame" or internally model the world around you in economic / Adam Smith terms (e.g., "The Markets" will provide, they always have.). If you grow up as a political science student, you tend to "frame" the world around you in socio-political power terms (e.g., Only "voting issues" matter to my survival --kind of paraphrasing Bill Clinton here). If you grow up as a geology / science student, you tend to "frame" the world around you in geological /scientific terms (e.g., e=mc^2, blah blah boring math model stuff --although this framing system is not going to get you far in the financial-power / political-power world because they don't and can't "see" or "hear" or "feel" the world in that way). Government --as it is-- will never hear Bartlett because they (lawyers, financial power gurus, etc.) are incapable of framing the world's reality in those terms. "What do you mean population "growth" is bad? No. Growth is good. Greed is good. Population growth equals economic "growth". Economic growth means more tax revenues. Population growth in my Congressional District equals more power for the all important "me". Barlett's ideas defy the reality of my world and therefore he is clearly wrong. Not even worth debating it. Excuse me, I have an important meeting to go to. We're building another bridge to nowhere. Isn't this system grand? I love it. What's good for "me" is good for America, good for the world. That simple and sound truth is non-negotiable." Good that the APS is getting on board with this. For the past 15 years I have been getting their e-mail newsletter and the front-and-center news is always about fusion research. They would never have any context beyond reports of congreesional hearings and testimonies. Just a note - this is from the APS Forum on Physics and Society (FPS). The newsletter you used to get was probably Robert Parks' "What's New" - that was sort of an independent early "blog" in reality, put out by Parks from the APS Washington office, but it was kind of divorced from the membership of the organization otherwise. I've been a member of the FPS forever, have written a few letters and articles for the newsletter; it's quite grassroots and it's always been very activist. You could learn a lot, particularly about nuclear power and security issues, going through their archives.